Kirsten Stave ’18 learned more than she expected at her internship with local nonprofit group Emerging Prairie. A forward-thinking community, unique hands-on experiences, and endless opportunities for growth gave her the tools she needed to affirm her goals and put her “servant-driven heart” to good use. Kirsten Stave ’18, Rolette, N.D.
My dad was a Cobber, so throughout my teen years we’d always “conveniently” wind up driving by Concordia while we were in Fargo-Moorhead. But like all teens, I wanted to do exactly the opposite of whatever was suggested, so for most of high school Concordia was off the table. After an interview for a speech and debate scholarship at Concordia, I definitely got the admittedly cliché feeling everyone talks about when it all sort of clicks. I fell in love with the driven campus culture and intentional care for every single student. I believe reflecting on the profound growth that I’ve experienced academically, professionally, and personally in the last three years is a testament to that feeling. What campus organizations/activities have you been involved with? Homecoming Executive Committee, Orientation Team, Oral Communication Center, Residence Life, Concordia Speech Team, Concordia On-Air, Omicron Delta Kappa Honor Society, and Lambda Pi Eta Communication Honor Society. Tell us a little about Emerging Prairie. Emerging Prairie is an entrepreneurial development nonprofit, focused on celebrating and empowering local risk takers of all kinds. We do our best to follow several high-level principles the founders set in 2013: educate our city, infuse the arts, build on bright spots, and practice radical inclusivity. I know, very cool. 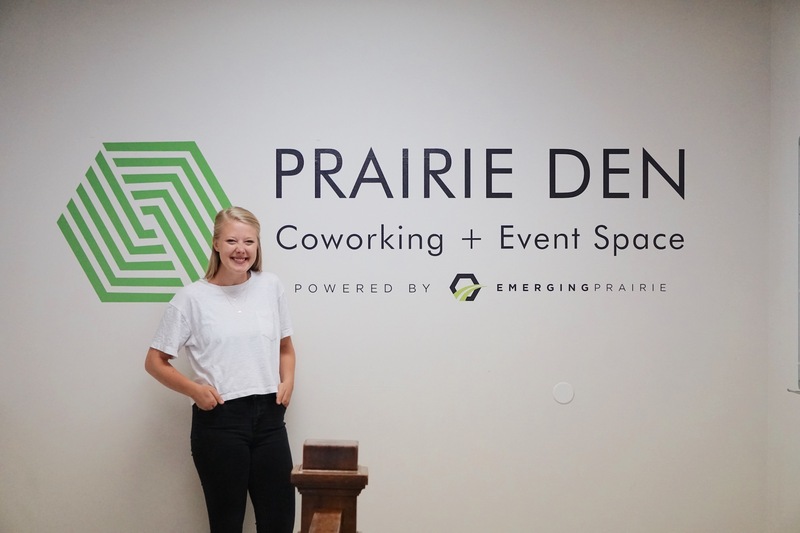 This is done by operating a variety of community programming like 1 Million Cups (1MC) Fargo and the Prairie Den co-working space, as well as events like Drone Focus and TEDxFargo. I actually interviewed for a position at a different organization and, afterward, my interviewer called Annie Wood (my current supervisor) and mentioned that based on what we had chatted about during the interview, I might be a good fit for Emerging Prairie. A few days later I got a phone call from Annie, and the rest is history! I think it’s a wonderful representation of the tight-knit network that is the Fargo-Moorhead community. What is your role with EP this summer? I’ve had the opportunity to work in a couple different roles – the beauty of a small team! These roles primarily functioned in tandem with the two conferences we put on this summer: Drone Focus and TEDxFargo. For Drone Focus, I got to work with the team that prepped for Secretary of Transportation Elaine Chao’s time in Fargo, as well as some external meetings. With TEDxFargo, I had the very cool opportunity of taking care of the speakers, and all the wonderful logistical details that come with that. In addition, I was on point for about a dozen external workshops – we call them adventures! – with local organizations, businesses, and speakers that are intended to jump-start the TEDx experience and showcase the very cool things our local peeps are doing. I also got to put my English writing major skills to use by crafting and publishing the weekly Emerging Prairie newsletter. Did anything surprise you when planning TEDxFargo? I’ve learned that when you’re working with other people, it’s important to simply expect surprises. (Is that an oxymoron? Probably.) There is an incredible amount of moving parts, and for a small team that means you’re firing on all cylinders 100 percent of the time. 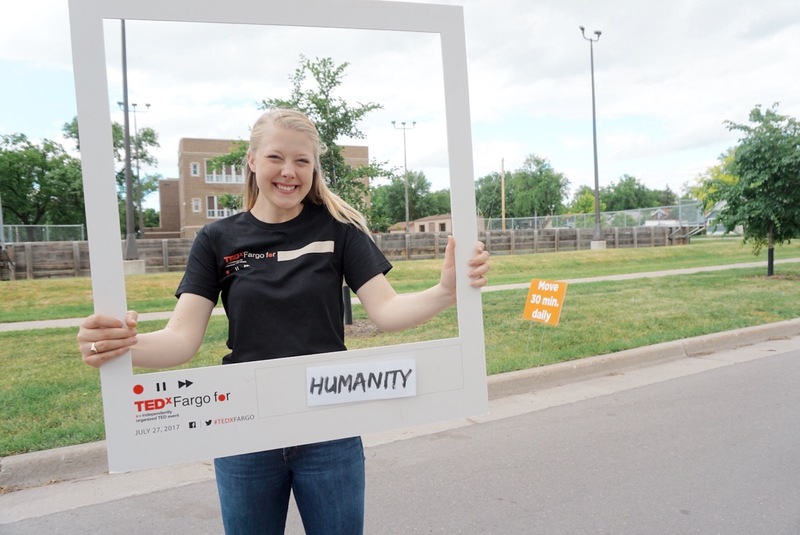 Why do you think it’s important to have a TEDx event held in Fargo? Accessibility to awesome ideas is so close to my heart. Further, to create a safe environment where individuals can be deeply challenged, inspired, and lifted up by these ideas is beautiful and necessary if growth is to happen within our communities. As a communication and English-centric super nerd, the written and spoken word has incredible power, especially when experienced as a mass collective. What is your greatest takeaway from the event? Oh boy. One? I’ll try. The event itself took me by surprise – when you’re in the midst of the nitty gritty details, it’s easy to lose sight of the “why.” In any work that I do, I’m driven and motivated by this, so on event day I was continually knocked to my feet by these small but invaluable moments that absolutely affirmed the “why.” Overall, I was reminded that Thursday was much bigger than the conference itself. For instance, the collective empathy that took place during the standing ovations is, in and of itself, a performance. In this, the audience is showing not only the speaker, but each other, that there is a unified emotive response and potential for collective action. It’s in this unity, everyone standing together lifting an idea up, that we can tangibly see love and compassion at work. And that’s not only pretty cool, but super important for moving a community forward. What have you learned from your experience with EP? My seven months with EP affirmed my end-goal. That big, lofty one: what I need my life to stand for. Of course, I came away from this experience with hard skills like event coordination, (lots of) Excel experience, crisis management, and a couple others – but, more importantly, it allowed me the opportunity to use my Type A brain and servant-driven heart to care deeply for others. I now understand more than ever that treating details with the utmost care, acting from a place of patience and understanding, and doing what you can to do more, allows others to engage in an experience in which they can grow. And if we do that, we only foster a healthier, happier community.